Although I am contemplating a control scheme with dual nunchucks instead for playing emulators and PC games etc. It is definitely not DCC, which is a signaling protocol that goes out over the track to talk to a decoder/motor controller. This is just PWM dc being generated by a L293 quad half-h (on a shield) and controlled by the Arduino. 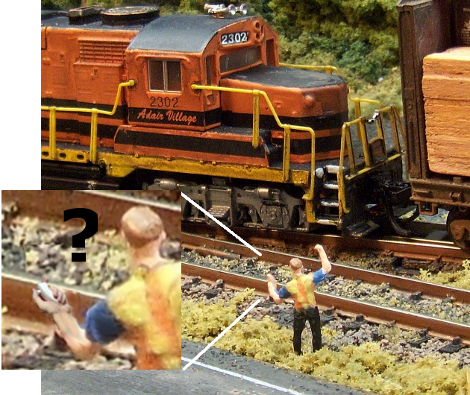 I was about to post that his model looks like it’s made from clay, then I noticed that the track is N scale. I’ll put that aside from now to make my major gripe: This has absolutely nothing at all to do with DCC, not even a custom protocol. He is simply putting PWM power to the tracks. If he wanted to do this properly, he would should give constant DV power to the rails, and use a micro (ATtiny would work perfectly) on the train itself to provide variable voltage to the motor. The rails wont act like an antenna this way, and you can make the trains do some cool stuff, like individual profiles about speeds, lighting, etc. as for the toy, its KINDA slow to respond and as for analog speed control…. anyone know WHY it doesnt have it? If he is using standard DC trains there is a slight risk of damage, or at least that is what the E-Z command manual says, though I realize this is not real DCC. What I want to know is has anyone tried to hack an E-Z command controller to work on a PC or boost the power. They use the Lenz X-Bus interface and have a serial I/O port on the back which you can use a separate walk around controller with. I was wonder if this was some straight forward serial communication or are they encoding it. I am new to all this train stuff but would love to hack the system I have with some heavy modifications.